A Spanish judge has withdrawn European arrest warrants for ousted Catalan President Carles Puigdemont and four other ex-ministers. They fled to Belgium a month ago after declaring unilateral independence in a referendum ruled illegal by Spain. Despite the move, the judge said they still faced possible charges for sedition and rebellion. Rebellion is considered one of the most serious crimes in Spain, carrying a jail term of up to 30 years. Spanish Supreme Court judge Pablo Llareno announced the warrant's withdrawal on Tuesday morning, citing the willingness the Catalan leaders had shown to return ahead of fresh regional elections being held on 21 December. He said the European-wide warrant would complicate the Spanish legal probe, and its removal allows Spain to gain full control over the investigation. The ministers turned themselves into Belgian authorities after the warrant was issued last month, but were freed after being questioned. A Belgian judge was previously expected to rule whether to extradite the ministers on 14 December. The five were fighting the move, saying they may not receive a fair trial on their return. Mr Puigdemont has previously said he would return if this was guaranteed. On Monday six Catalan ex-ministers being held in a prison near Madrid were released from prison on bail. But two others, including former Catalan Vice President Orial Junqueras, were remanded in custody. Campaigning has now officially started ahead of the new vote organised by Spanish authorities in an attempt to try and resolve the Catalonia crisis. 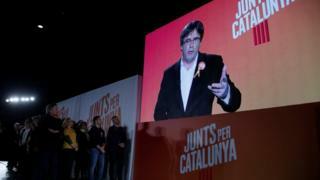 Mr Puigdemont labelled the election as a choice between "nation or submission" while speaking on a video link from Belgium to a rally in Barcelona on Monday night. He said voters must chose "between Catalan institutions or dark characters in Madrid". 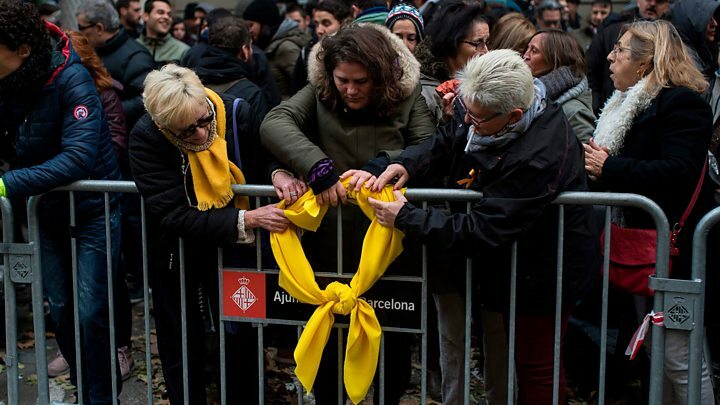 A seat reserved for the former leader at the event was marked with a yellow ribbon, an emblem that has become a symbol of support for the jailed politicians. All but one of the 13 Catalan leaders sacked by the Spanish government after the independence referendum are standing for election again in the fresh vote. A new opinion poll, conducted by the Spanish Centre for Sociological Research (CIS) in late November, suggests that pro-independence parties will fall narrowly short of an absolute majority in the December election. Mr Puidgemont and Mr Junqueras' pro-separatist parties are campaigning separately in the new vote, after a divide emerged over the future of the region following the nulled referendum. The parties ran together in the 2015 election when separatist parties won an overall majority in the Catalan parliament when they won 72 seats.